The costume doctor is in! 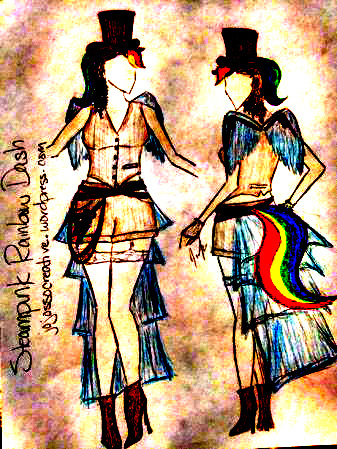 My friend, Cat, recently asked for advice on how to make a Steampunk Rainbow Dash costume. These are my shopping suggestions, techniques and advice on how to execute the design. Love you, Cat! Thanks again for the great inspiration! TIP: For an aged leather effect lightly dust the hat with the brown paint rather than going for full coverage. To do this, hold the can at least 12” away and apply in sweeping circular motions. TIP: Apply with metal elements to wings with super glue or epoxy glue. These were some great finds on Amazon that were not too expensive and also items you could use again either in real life or other costumes! Garter stockings: go to Amazon.com and just search thigh highs and garter belts, there were SOOO many options! Vest , Shorts & Belts: Head to a thrift store for a vest and some slacks you can cut into shorts. The tweedier the better. Also look for leather belts. TIP: Ladies, you’ll probably find leather belts more easily in the Men’s section. Bangs, Mane & Tail: You can actually make very awesome horse/pony tails out of acrylic yarn. It’s cheap and very easy! Sometime in the future I will do a full How-To article on tails, but for now you’ll just get the basics. Don’t worry, if you get totally lost just google it. Using your scissors, cut 20 40” pieces of ONE color of yarn. Place the pieces of yarn together into a stack. Secure the end with a rubber band or thin ponytail holder and braid 2-3 inches the stack and secure with a small piece of yarn. Use your flat iron to smooth out the strands. Repeat steps 1-4 for each color in the Rainbow Dash tail. Once you have all the colors, secure them together at the base of the braided part with a small piece of yarn. Untie the braids lay the yarn as flat as possible and glue to the underside of the belt of your choice. Trim off excess yarn that sticks out above the width of the belt. 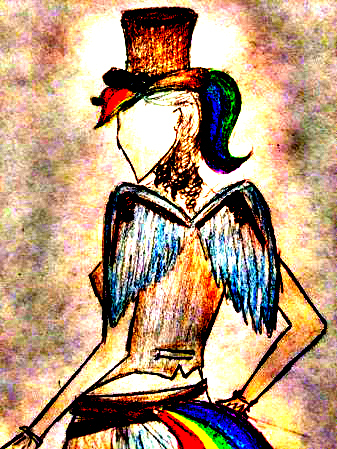 For the bangs and mane to go on the Steampunk top hat, use shorter pieces of yarn in smaller bunches. Glue directly to hat and then cover with Steampunk goggles. Supplies: (1) Sheet White Craft Foam; color photo print out of my Steampunk Rainbow Dash Cutie Mark; Various brass/copper chains from your local hardware store. Glue the photo to the white craft foam. Let the glue dry. Affix the Cutie Mark to the chains with super glue or epoxy glue. Optional: Simply cut out the photo and have it laminated. Previous Let’s Be Online Besties!